Sure, there may already be a veritable cornucopia of dictionaries, thesauruses, and other word reference apps out there, but Thesaurus Rex is the thesaurus app to end all thesaurus apps. Packed with more information than you could ever hope to know and fast to boot, this will become the last word reference software you'll need. Provides a full, offline thesaurus with seemingly endless customizable options to give you the fastest, easiest, and most accurate search it can. The one (slight) mark against the app is that you can actually find all the same information online and for free—but this is also one of its most appealing qualities. Being capable of functioning entirely offline, you'll never be without a thesaurus by your side, and a highly personalized one at that. 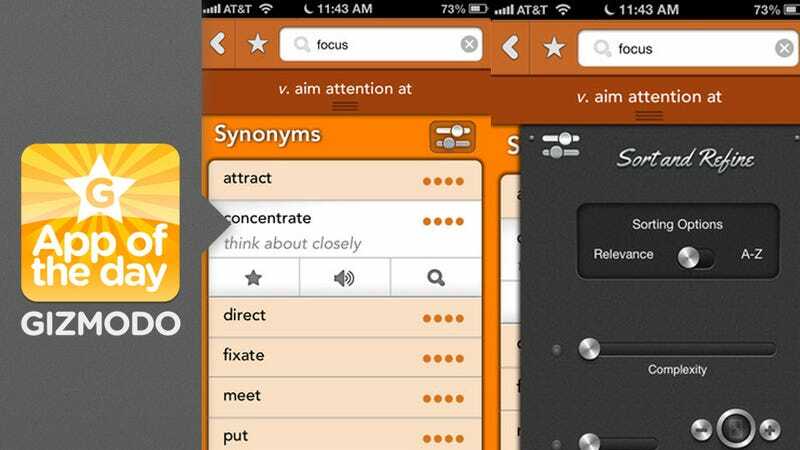 Save lists of your favorite synonyms, make it pick the most complicated, erudite words it can, and you can even pick the exact length of the synonym you're looking for. At $3, it's more expensive than other lesser apps like it, but compared to the hundreds of dollars these things used to cost, it's a steal.